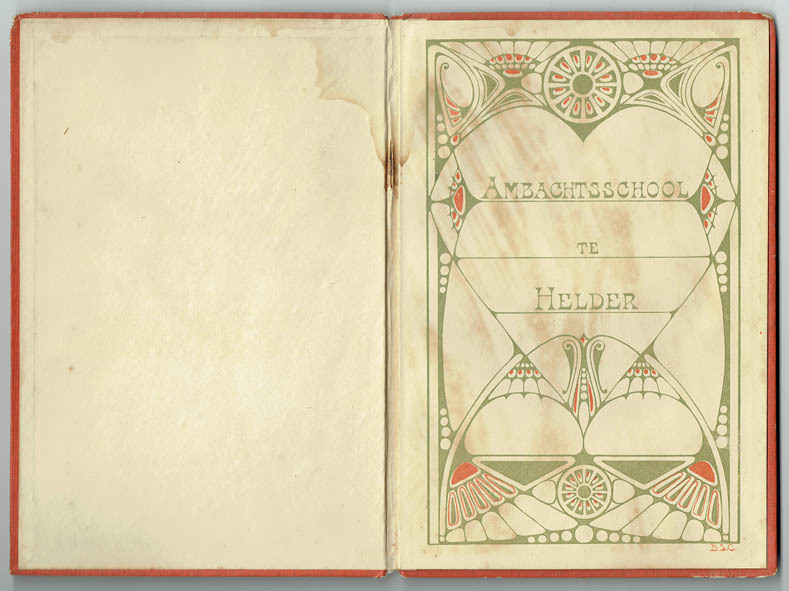 In the second half of the 19th century many crafts schools were established in the Netherlands. Due to the industrial revolution there was a lot of demand for craftsmen. 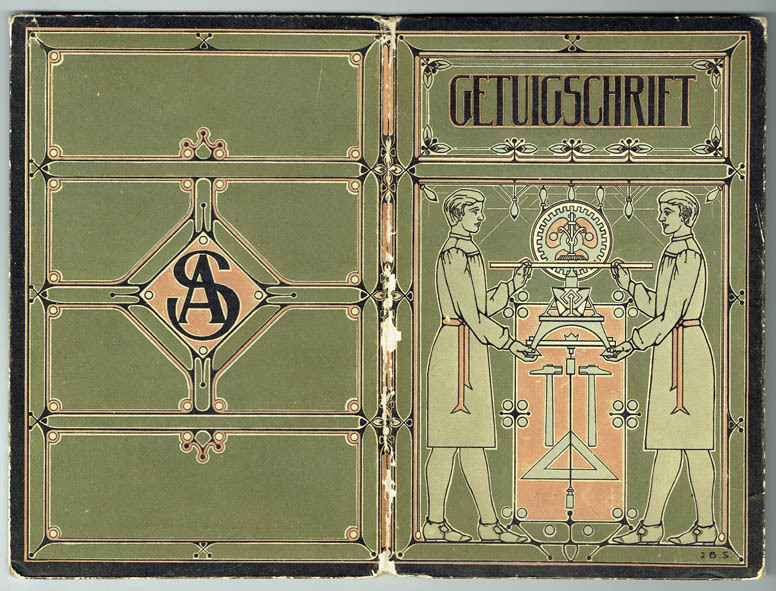 At the so-called ‘ambachtsschool’, boys from the working class were trained as a smith, carpenter, furniture maker, painter, lathe operator, instrument maker or electrician. It was also possible to learn how to repair bicycles, motors and cars or do a course in metalworking or electrical theory. Depending on the level the training lasted 2, 3 or 4 years. After completing the education or course, the students received an ornamental diploma. 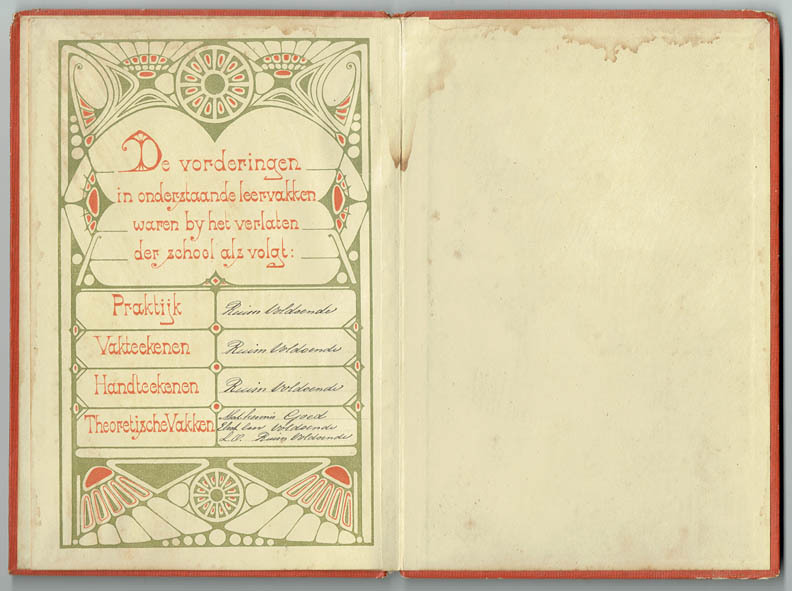 Many of these beautiful decorated certificates are designed in the style of the Nieuwe Kunst (New Art), the Dutch variant of Art Nouveau. Characteristic of this style are the stylized natural motifs and geometric ornamentation. Analysing nature and reducing its forms such as flowers, leaves and animals to two-dimensional ornaments was an important part of the education to young craftsmen and designers. They were taught how to use mathematical design systems based on basic forms as triangles, rectangles and circles. The 2 certificates shown in this blog post were also designed in this way. 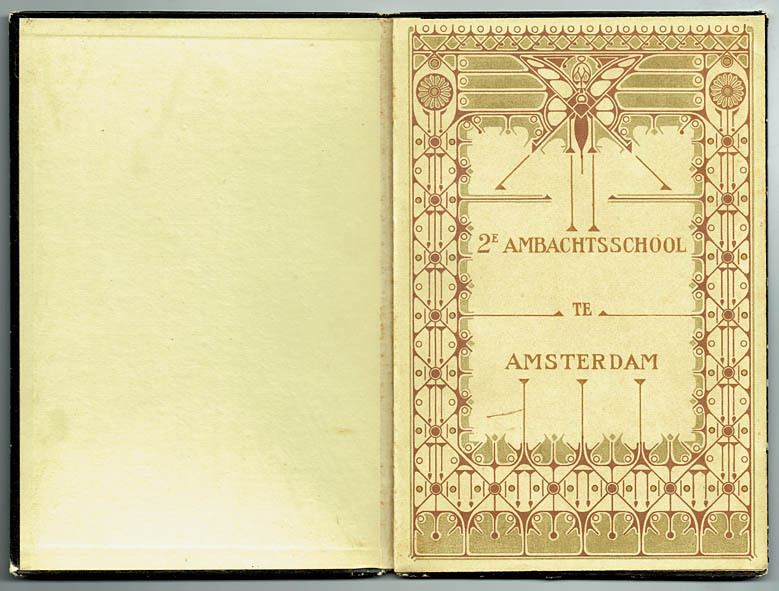 The book ornamentation for the diploma of the ‘2e Ambachtsschool in Amsterdam’ was made by bookbinder Johannes B. Smits. 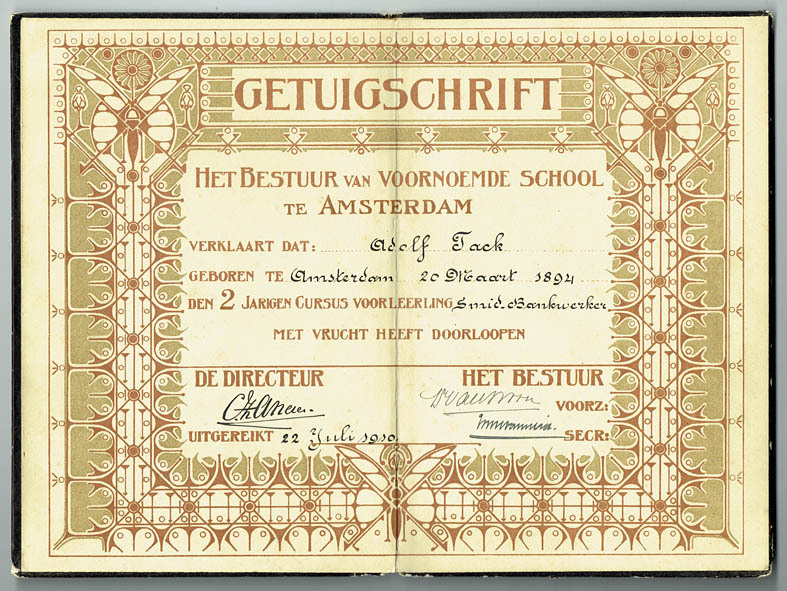 He was also working as a teacher at the Dagteeken- en Kunstambachtschool voor meisjes Amsterdam (Amsterdam women’s school for arts & crafts) and later at the school for applied arts in Zurich. 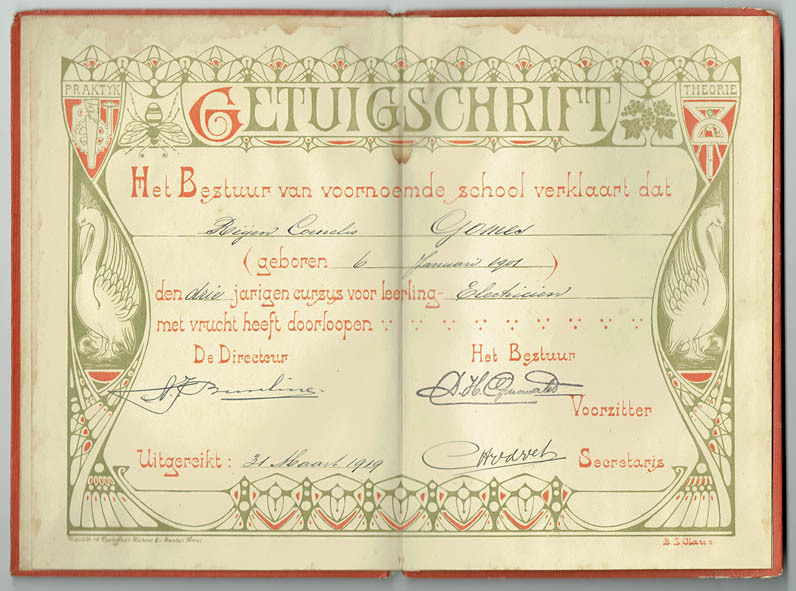 Benjamin S. Claus decorated the diploma of the ‘Ambachtsschool in (Den) Helder’. Claus gave drawing lessons at the crafts school in Arnhem. His style is influenced by the ‘foreign’ Art Nouveau; the lines are more flowing and the natural motifs are less stylized. Both designs contain motives that refer to the crafts education, such as hammers, a protractor and a pair of compasses. The flowers and bees are symbols for growth and diligence, which are necessary to succeed. The pelicans in the design of Claus refer to the educational and protective role of the teachers. 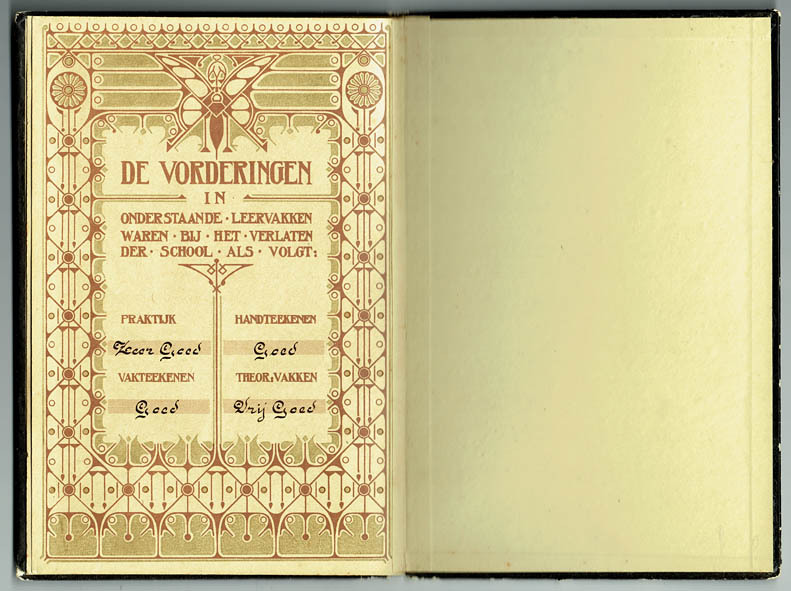 The booklets were made by Boek- en Kunstdrukkerij v/h Roeloffzen-Hübner & Van Santen in Amsterdam. They have the same size and are made of the same paper and cardboard. 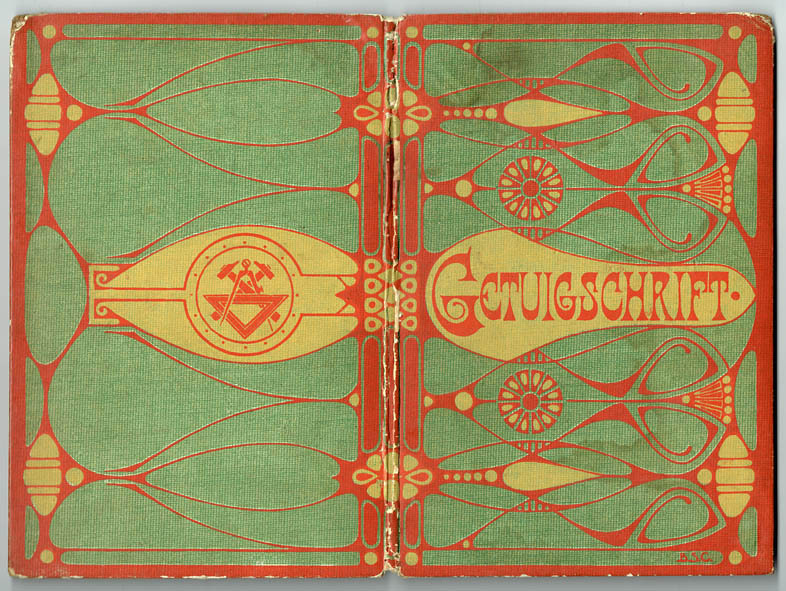 The designs of the front plates, title pages, inside pages, end pages and back plates are constructed in the same way. Also the texts (with the exception of the name of the school) are the same on each page. On the internet there are other pictures of ornamental certificates with the same similarities but with other designs. It seems that Roeloffzen-Hübner & Van Santen offered different kinds of diplomas from which the schools could choose.